In Georgia there's one of our favorite restaurants. New age, cool art on the walls kind of place. Next door to the cafe is a bakery where you can buy a lot of what they sell in the restaurant. One of the best best best things they make are these biscuits. They're just heaven. And you slather them with cranberry apple butter and life just got expontentially better. In response to my whining, Matt made these. They're both a labor of love, so be prepared to work a little. But it is SO worth it. Preheat oven to 375. Line a sheet pan with parchment paper. Make a well in the center of the flour and pour in all the heavy cream and the half and half. Sir the dry ingredients into the cream and mix with a wooden spoon until dough just begins to come together into a ball. Turn dough onto a lightly floured surface adn kead 2 or 3 times to form a cohesive mass. Do not overwork the dough. Using a rolling pin, roll the dough to a 1-inch thickness. The correct thickness is the key to obtaining a states biscuit. Dip a 2 1/2 inch biscuit cutter in flour, then cut the dough. Repeat until all the dough has been cut. Scraps can be gathered together and rerolled one more time. Place the biscuits on the prepared sheet pan, leaving about 1/4 inch between them. Bruths the tops of the biscuts with 1 tablesoon of half and half and sprinkle with 1 tablesppon of sugar. Makes 8-12 biscuits depending on the size of the cutter. Place sugar, spices, and orange juice in a large, heavey bottomed saucepan. Bring to a simmer and add the cranberries. Cook over medium heat until cranberries begin to pop. Add the apples and cook over low heat, stirring frequently. Cook until appleas are tender and falling apart. Puree contents of saucepan in a food processor until smooth and thick. 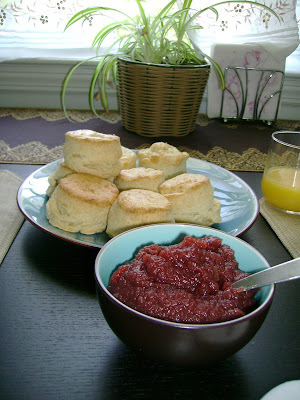 Cool and serve with hot biscuits. This will keep for 2-3 weeks in the frig. Makes 4 1/2 cups.